I scored much of this ensemble on Black Friday. My "go to" store, LOFT, had great sales and I snatched up this wine colored turtleneck tunic and black ponte pants. The tunic was on sale for $20 on Black Friday but it is 50% off right now online, making it $30 (still a great price!). It comes in several colors and almost all sizes are available! I love the length and the soft, thin material. In the past, I've steered away from leggings. I'm not sure why, other than I just didn't feel comfortable in them. My sister wears them all the time, and they look great! I've decided to get over my insecurities and branch out! These seamed ponte pants are a thick legging and I've been living in them lately! They pair perfectly with long sweaters like this turtleneck. Also, they are easy to tuck into boots and booties! I got them half off, so keep an eye out on the website for upcoming sales! I like the thickness of these, but any black legging you have would work nicely. To elevate this look, I added my Baublebar Pearl Bib statement necklace. If you follow my Instagram, I shared last week that this necklace was marked down to $25! It sold out fast, but there is a very similar, slightly smaller version available that I also adore. Don't fear, my version will be back, and I'll let you know when! The great thing about this tunic is that you can pair many different kinds of necklaces with it, from statement pieces to long necklaces. These B.O.C. black booties were another great Black Friday find at Macy's. 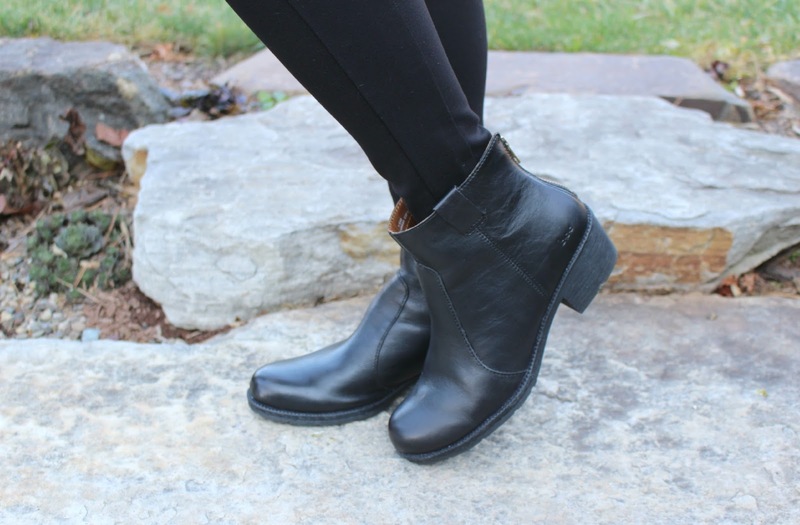 They are the perfect flat black bootie (I've been searching for some time...) and super comfy! I was drawn to the gold zipper detail in the back. I have a feeling these boots will get a ton of wear! FYI, they are 25% off at Macy's with code FRIEND. Once you have that perfect holiday outfit, you will need a chic coat to go along with it (after all, it is winter)! This beautiful Michael Kors coat is on sale at Macy's for $129.99 and is an EXTRA 25% off, making it $97.50! This is an excellent price for this coat. I love the gold buttons and belted waist. Also, it has a removable hood, for extra warmth! This dress coat is so elegant and can be worn over skirts and dresses, or outfits like I've styled here today. Ladies, put this coat on your Christmas wish list! So, what holiday events would you wear this outfit to!? As always, thanks for visiting my blog!! Have a good weekend! Ephesians 5:20, "Always give thanks to God the Father for everything, in the name of our Lord Jesus Christ." That's a great tunic, and you KNOW I love that bag! I found a similar one at Nordstrom. LOVE it. Awesome! I saw it in a few pics- really cute! That necklace is amazing. I love the outfit too! Cute clutch & the coat!! 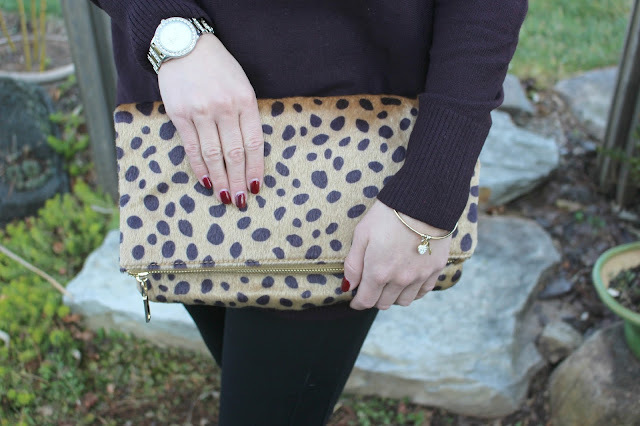 Great Jacket & I love these colors with the leopard together. One of my signature looks & that necklace is gorgeous. I love how comfy and fashionable you are! I just love that jacket too!! I am really digging that necklace! Great outfit, love that necklace!! Love the color combinations, smart!